Pump Shaft Quality (PSQ) has historically been used for precision shafting in pumps. Now, there are many more applications requiring these tighter diameter tolerances. 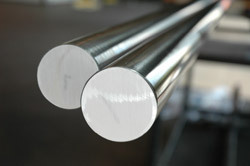 PSQ indicates turned, ground and polished shafting used in the rotating industries. The tight diametrical tolerance achieved through grinding decreases wear and gives a more constant product with controlled properties. This product is also straightened to give minimal vibration throughout the length of the shaft. Here at ESP, we stock both 316/L and 416 in PSQ, ranging in size from 3/4″ dia. to 4″. Have a requirement outside this range? Call us at 1-888-377-4317 and we can help you with your sourcing. With tight diameter tolerances and precision straightness, PSQ requires special considerations when shipping and handling. Our packaging options include cardboard tubing, wooden boxes, and corrugated Reddi-Pac. For more information, please click on the following links: Pump Shaft Quality, PSQ Handout, or contact us today.